All On 4 Dental Implant Treatment - What are the advantages? The term All On 4 Dental Implant treatment is a registered trademark of a technique promoted by Nobel Biocare, a dental implant company. It refers to a method of replacing all your teeth in your upper OR lower jaw with a full denture that is supported by just 4 dental implants. Why is that anything remarkable? What's the advantage? Imagine you have lost all your upper teeth. You only have gums. 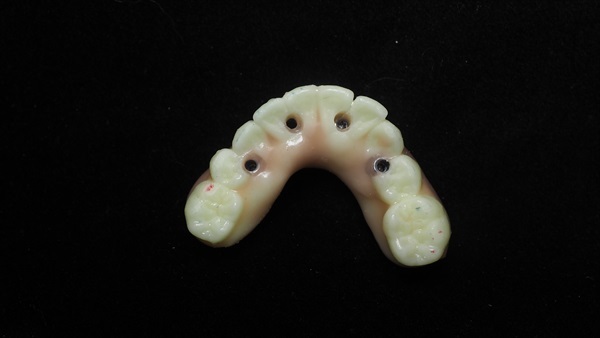 The standard normal way to replace those teeth for you is with a full upper denture. AND, normally, that would be OK. But full dentures have some disadvantages. The main one is that they are not fixed in place. They just sit on your gums, and hopefully there will be some suction under the denture to hold it in place. A good denture adhesive can help. BUT a full denture will always tend to wobble a bit, sometimes when you talk, and especially when you eat something. And you can forget about chewing anything hard - with a full denture resting on your gums, you can only exert about 30% of the biting force that you can with natural teeth. That's only one third of the force. SO, people have been looking for ways to get that full denture to sit firmly in place. How might it be possible to anchor it down, so it doesn't move? The answer is dental implants. A dental implant is essentially an artificial tooth root, made from surgical-grade titanium. There are also metal-free ceramic implants, but they are not really suitable for all on 4 dental implant situations. A dental implant can be put into place immediately after a tooth has been removed, OR it can be put into place much later, years after the tooth was removed. So, if want to replace one missing tooth, you now have an option to get a dental implant. If you are missing 3 teeth in a row, you may only need 2 implants, carrying a 3-tooth bridge. If you are missing (say) 6 teeth in a row, you don't need 6 implants. 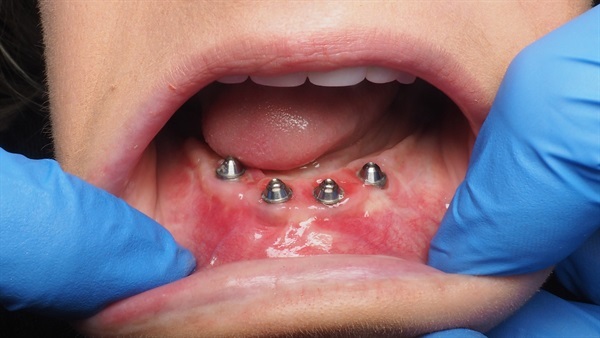 You may only need 3 or 4 implant, carrying the 6-tooth bridge. But what if you are missing ALL your upper teeth? (for example). That's 14 teeth for most people. How many dental implants do you need to support a bridge or denture to carry 14 teeth? Normally it would be about 8 implants. Sometimes we can get away with 6 implants. But "All on 4 dental implants"? How can you get away with only 4 implants to replace 14 teeth? And why would you want to? There are several things I have to tell you, in order to qualify that claim of "All On 4". First, it's not always possible. 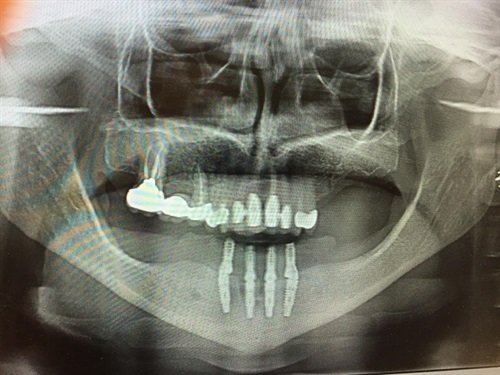 If your jawbone is more porous than usual, it won't be strong enough to take the full weight of the bite of 14 teeth on only 4 implants. So you will need maybe 6 implants, especially in the upper jaw. The bone of the LOWER jaw is much more dense, and can "grip"the dental implants much more firmly than in the upper jaw. Second, we don't give you 14 teeth. Research shows that humans can chew perfectly well with just 20 teeth - that's 10 teeth on the top jaw and 10 teeth on the bottom jaw. So the 4 dental implants only have to carry 10 teeth, NOT 14. That's about 30% less weight to be borne by the implants. Third, it doesn't always work. It's important to understand that dental implant treatment is not an exact science. We can't just plan it, do it, and guarantee a successful case. There's a worldwide failure rate of around 5%. Read more at dental implants. It's less expensive. I won't say it's cheaper, because all dental implant treatment is expensive. But All On 4 can be significantly less expensive. Also, because you're only getting 4 dental implants rather than 6 or 8, there's less surgical trauma, which means less after pain during healing, faster healing, and a lower chance of complications after the implants are fitted. There is also the concept of avoiding important structures such as blood vessels, nerves, and sinus cavities. This means avoiding complicated surgery, like bone grafting, sinus lifts and bone ridge augmentation. These surgical procedures are intended to create a stronger bone "bed" for your implants, but they will lengthen the course of treatment (because they must heal before you can move on to the nest step); and of course the procedure may fail to heal as expected, become infected, and need further surgery to correct. The All On 4 dental implant concept deals with these potential problems by placing some of the implants at an angle, pointing away from the problem area. Implants that are at an angle can have their own problems, too, of course. 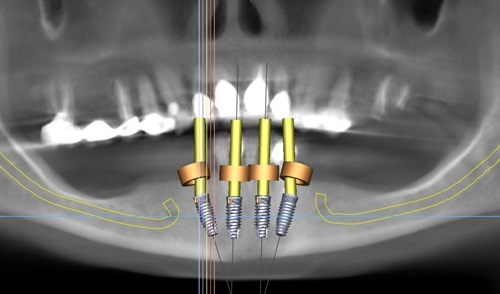 The biggest problem is getting a metal framework to fit over all the implants, which are at different angles. However, this is an ENGINEERING problem, and Nobel Biocare has solved it with ingenious screw-fitted adaptors. This means that your dental implants can be angled almost wherever they need to go in order to reduce the complexity of treatment. and faster healing after surgery. BUT what are the possible disadvantages? All On 4 dental implant treatment is involved and complicated. For this to work, it has to be planned meticulously. That means getting a cone-beam CT scan of your jaw, and top quality digital planning. The Nobel Biocare technique claims to offer "immediate loading" - which means fitting an interim (or temporary) denture straight onto the implants immediately after they are fitted. So you walk out of the dental office after your implant surgery with teeth! BUT this goes against the basic principles of implant surgery as laid own by the father of dental implants, Professor Ingvar Branemark, an orthopaedic surgeon. He insisted that there should be NO weight or movement on the implant until it had fully healed - about 3 to 4 months AFTER surgery. So this "immediate loading" business is a little risky. What can go wrong? One of the implants may not heal fully, and becomes loose. Once that happens, it will NEVER become firm again. It will have to be removed, and a new implant fitted in it's place. This will delay your final result by 3 to 6 months. SO we can say that, if your jawbone is dense enough, and you can work with 10 teeth, you might have a shot at All On 4 dental implant treatment working for you. First, you need a cone-beam CT scan of your jaws. This shows the dentist the shape and density of the jawbone, and also where important structures such as nerves, blood vessels and sinus cavities are. He must avoid these structures during surgery. But the scan itself is just the start. It's not like an X-ray, where you can see the final picture quickly. The CT scan must be interpreted and rendered by a human being. A specialist. This takes time. And his skill is essential in producing an accurate 3-dimensional image that the dentist can use in order to plan EXACTLY where each implant needs to be positioned. This introduces a possibility of human error. Next, the dental lab can construct an acrylic guide to help the dentist to position the 4 implants in the best position and the correct angle, to get the best foundation for each implant while avoiding any nerves, blood vessels and sinus cavities. They can also make up the temporary denture which will be fitted to the implants. Then it's time for surgery. Treatment is carried out under sedation, which means you are very relaxed, and don't care too much what's going on. After making sure that your jaw is very numb, with local anesthetic, the dentist will put the small acrylic guide over your gum, and use the guide holes to make the spaces in your jaw bone for the implants. Then the implants are fitted into your jaw, and temporary caps placed over the top of the implants to allow the gum to heal up. Then he may put a temporary (or "interim") denture in place, so that you have teeth when you walk out of the office. AND here is a link to Nobel Biocare. After your implants have healed, and are firmly embedded, (ie.have become "integrated" with your jawbone), it's time get your final set of teeth made up. Your dentist will take fresh moulds (or "impressions) of your jaws, and send them off to the dental laboratory. They will construct a trial-run set of teeth that fits over your new All On 4 dental implants, and your dentist will do a trial fitting. If everything is OK, he will send the trial set back to the lab to be finished. About a week later you will have your brand-new All On 4 dental implant supported set of teeth! To help avoid surface gum infections around your implants, I always recommend using Therabreath Perio Rinse mouthwash, especially if you get an oral irrigator and put the mouthwash into the water tank instead of plain water!